In 1854, Congress passed the Kansas-Nebraska Act, allowing the residents of those territories to settle the subject of slavery by popular vote. It was widely regarded as an act of bad faith, as its passage wrecked the Missouri Compromise of 1820 and the Compromise of 1850, both of which had been responsible for holding the Union together. While less momentous, the previous year Congress had passed the Mint Act of 1853, another piece of legislation regarded as an act of bad faith, as it reduced the amount of silver in most U.S. coins by almost 7%. This reduction was necessary in order to return silver coins to circulation. Prior to 1853, silver coins had been melted in large numbers, as they were worth more than their face value. Now the smaller denomination coins were returning to circulation, but many in Congress sincerely believed that the passage of the Mint Act cheated the American people of the full measure of value inherent in their coinage. By early 1854, the coin shortage had ended, and more than a million dollars worth of silver coins were stored in the vaults of the Mint awaiting purchasers. The new, lighter weight coins were a life-giving force for retail trade throughout the country, and for the first time since the founding of the Republic the nation had an ample supply of small coins of uniform quality. 1854 saw more than twelve million quarters struck in the Philadelphia Mint alone. But the explanation of such a large mintage goes well beyond meeting the nation's needs for coinage at the time and is another example of bad faith with the American people-this time by the mal-administration of the law itself. The Mint Act of 1853 specifically required Mint officials to purchase silver bullion from the Mint's bullion fund and then sell the new coins to the public in exchange for gold coins only. This would keep the fractional silver pieces, with their limited legal tender status, from becoming an overabundant nuisance. What Mint Director James Ross Snowden did, however, was to pay out the new silver coins to bullion depositors in exchange for their silver. Even after the market price of silver bullion had fallen, the Mint continued this illegal practice. By setting no limits on the amount of bullion the Mint would purchase, Snowden effectively allowed the free coinage of silver, a practice Congress wished to discontinue in 1853. Conceived as a means of relieving the previous coin shortage, this situation virtually guaranteed that there would soon be too many silver coins in circulation. Under other circumstances, this policy might not have presented any particular problems, but the coins authorized by the Mint Act of 1853 were only legal tender in amounts up to five dollars. As the Mint Act did not allow for redemption of the coins. and there was no possibility of exporting them (as there had been with the heavier, old-tenor coins), oversupply was inevitable, and it came quickly. Soon, retail stores refused silver coins except for small payments, and even banks declined to accept them for deposits. Some businesses that received large amounts of change were forced to sell their surplus to brokers at a discount. The situation became so serious that Treasury Secretary James Guthrie temporarily suspended the coinage of quarters and half dollars, but he never investigated the Mint policy responsible for the oversupply. This redundancy in the nation's silver supply lasted until 1862, when the government finally suspended specie payments and coins once again disappeared from circulation. With $100.00 face value in old-tenor (pre-1853) silver coins still selling for $106.60 in 1854, Mint Director Snowden believed that their value was still sufficiently high enough to warrant retaining some type of identifying mark on the new 1854 coins. Thus, the arrowheads placed on the 1853 issues remained at either side of the date. The glory of rays on the reverse of the quarter and half dollar, however, required an extra operation in die preparation and shortened die life considerably, so Snowden ordered their removal. Otherwise, this design is a continuation of the motifs originally engraved by Christian Gobrecht in the late 1830s, with the obverse depicting Liberty seated on a rock, surrounded by thirteen stars, and a spread-winged eagle encircled by the inscriptions UNITED STATES OF AMERICA and QUAR. DOL. on the reverse. 1854 and 1855 saw Arrows quarters struck at three mints: Philadelphia (no mintmark), New Orleans (O) and San Francisco (S). Mintmarks are located on the reverse, just below the eagle. Five issues are represented in the total mintage of 17,293,400 pieces, of which the vast majority were produced at Philadelphia in 1854. New Orleans produced over 1.5 million coins in 1854, including the scarce, so-called Huge O mintmark variety, but minted only 176,000 pieces in 1855. This issue is the rarest in the series, particularly in high grade, along with the San Francisco issue of 1855, the only year that the western branch mint produced this design. In general, Arrows quarters are collected as type pieces. 1854 is usually the date of choice, as it is available with the most regularity. When collected by date and mint, the other four issues are usually considered a part of the much larger No Motto series. Counterfeits are generally not a problem with this type. Proofs are very rare, and deceptively prooflike business strikes that resemble proofs are more likely to be encountered than counterfeits. At most, a few dozen proofs are known from each year, including a unique branch-mint proof struck in San Francisco in 1855 that traces its pedigree to then-Mint Superintendent Robert Aiken Birdsall. 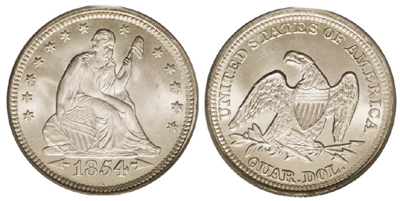 The grading of these coins is similar to that for all coins of the Seated Liberty type. The points to first show wear on the obverse are Liberty's knee, breast and hair; on the reverse, check the neck, claws and tops of the wings. After 1855, so few old-tenor silver coins remained in circulation that Director Snowden dropped the arrows from subsequent dates, even though the weight remained the same. The device of arrowheads at either side of the date was resurrected again in 1873 to designate another weight change, but this time a slight increase. BIBLIOGRAPHY: Bailey, Thomas A., The American Pageant, D.C. Heath and Company, Boston, MA, 1966. Bowers, Q. David, United States Dimes, Quarters and Half Dollars, Bowers and Melena Galleries, Wolfeboro, NH, 1986. Breen, Walter, Walter Breen's Complete Encyclopedia of U.S. and Colonial Coins, F.C.I. Press/Doubleday, New York, 1988. Briggs, Larry, The Comprehensive Encyclopedia of United States Liberty Seated Quarters, Larry Briggs Rare Coins, Lima, OH, 1991. Carothers, Neil, Fractional Money, A History of Small Coins and Fractional Paper Currency of the United States, John Wiley & Sons, London, 1930. Taxay, Don, The U.S. Mint and Coinage, Arco Publishing Co., New York, 1966.